Why Does Music Actually, Really, Definitely Matter? This is the first of several blog posts we’ll devote to (a) unpacking incomplete, inaccurate, and “truthy-sounding” advocacy claims about the values of music education, and, more importantly, (b) providing credible evidence about why music definitely matters. This is not to say that music education advocacy is an unimportant pursuit, or that all advocacy materials lack credible supporting evidence from serious researchers. Not at all. Some do. But many do not. Madden’s blog post is just one among many that make misleading and/or unsupported claims, as we’ll explain in a future post on this site. For now, let’s make two important points. First, we agree with eminent music education researchers and music psychologists like Dr. Donald Hodges, Director of the Music Research Institute (MRi) at the University of North Carolina-Greensboro, who urge music educators to be very thoughtful before accepting “truthy-sounding” claims about possible relationships between music and academic achievement: “I think we would be better off being more honest. What do the data really say? Those on either end of the spectrum—from those who want to hold that music is ‘pure’ and does not have anything to do with other academic subjects to those who feel that ‘music makes you smarter’—would do well to wrestle with the complexities that are being reported in the literature.” (Personal communication to us from Don Hodges, 8/15/2014). Second, we also agree with Hodges when he argues forcefully that “We should teach music for all the wonderful humanizing benefits that accrue, and if academic achievement is affected positively, that is extra value added.” (Personal communication to us from Don Hodges, 8/15/2014). But what are some of the “wonderful humanizing benefits that accrue” during and through the processes of effective, educative, and ethical school and community music education? An excellent practical example is demonstrated in a YouTube presentation (see below) by the extraordinary trumpeter Alison Balsom. 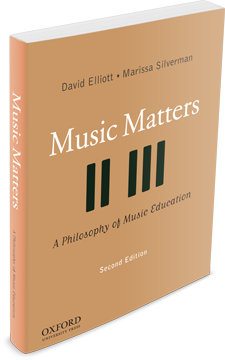 Balsom explains how musical participation can contribute to personal and community flourishing, which is a fundamental concept at the heart of our praxial philosophy of music education in Music Matters (e.g., pp. 17-21 and 43-52). After beginning her presentation with a performance of Debussy’s Syrinx at Royal Albert Hall, Balsom explains and illustrates—with real-life examples—how children’s active musical participation can “engage, empower, and repair” their personal, social, and community lives. At one point, she argues that music has the potential to “heal” in numerous ways, a statement that receives considerable support from numerous contemporary researchers in a wide range of fields (*see below). Toward the end of her presentation, Balsom shows a short film of her work with AfroBrass that focuses on facilitating children’s personal and community flourishing and overall health and well being through active music making and educationally caring relationships between Balsom, her colleagues, and the children. The children’s narratives detail how AfroBrass has made significant differences in their lives. Is it possible that some children do not benefit from participating in AfroBrass? Probably. Must we consider that this film is carefully edited? Yes. Nevertheless, it provides tangible evidence that, for many, this community music program is making a significant difference in the lives of these children. Moreover, as Balsom and her colleagues testify, their own lives and “personhoods” have been transformed deeply through their participation in the AfroBrass program. Are there more programs like this? There are thousands. Are school music educators carrying out this kind of work? We know many who are. But we’d love to hear more on this topic from readers who are already involved in putting their musical abilities “to work” in their schools and communities for students’ full human development and flourishing. In a recent article in the Music Educators Journal David explains why Balsom’s kind of music teaching—which is equally possible for school, community, and amateur music educators to carry out in their own schools and communities—might be thought of as “musical citizenship” or “artistic citizenship.” A central tenet of artistic citizenship is original to John Dewey, who argues that we need to “recover the continuity” between the arts and the normal processes and needs of people’s everyday lives. Are there ways we can add social and ethical weight to some of the things we do? Yes, of course. Balsom’s teaching is only one example. Indeed, the term “artistic citizenship” is not restricted to the educational or musical work of professional artists or “stars.” As we explain fully in Music Matters (e.g., pp. 268-270), the concept of “artistic citizenship” can and should apply more broadly to the music that all people (students, teachers, amateurs, and professionals) perform, improvise, compose, arrange, conduct, record, and teach for a wide range of human purposes. *Contemporary researchers in the neuroscience and neurobiology of music, music psychology, public health, human development, nursing and occupational therapy, emotional development, psychiatry, and so on substantiate Balsom’s claims in Music, Health, and Wellbeing, edited by Raymond MacDonald, Gunter Kreutz, and Laura Mitchel. The 34 chapters in this volume provide more evidence to support the kinds of arguments Balsom discusses. This entry was posted in Advocacy, Artistic Citizenship, Music Education. Bookmark the permalink.